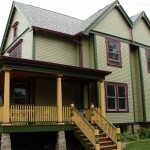 Windy City Construction & Design performed multiple projects Designing and creating additions to homes. Vinyl siding provides enduring beauty and design flexibility. Using a variety of siding and soffit styles, colors, accessories and trim, we can update a ranch, add character to a colonial or re-create a Victorian. Starting with great products is just the first step; as with any product, attention to detail and expert craftsmanship are a must to achieve an exceptional finished installation. Quality installation is something that many siding companies claim but few actually achieve. Since focus on quality is a cornerstone to Windy City siding installations, we approach every vinyl siding project with great care and attention to details. When we discuss vinyl siding project with our clients, we propose siding style so it is consistent with home’s design and fits into the environment and neighboring homes. In addition to selecting siding color, and type of exterior trim or architectural elements, we focus on size and thickness of siding panels as well as type and thickness of vinyl siding accessories. As an expert siding installer, our company holds numerous accreditations with various siding vendors and suppliers. We keep an ongoing dialog with vinyl siding manufacturers to provide our clients with the latest trends and developments in the vinyl siding industry. For example, one of the most popular solutions for energy savvy clients is residing with energy efficient vinyl siding such as Polar Wall Plus™— insulated siding featuring the Fullback™ Thermal Support System. Also, since manufacturing of vinyl siding has improved tremendously over the last few years, more and more Windy City clients consider this product for historical restorations siding projects. Windy City Construction and Design is an authorized installer of James Hardie fiber cement siding in Illinois. Compared to vinyl siding, fiber cement siding is more expensive. However, fiber cement provides lasting durability and is backed by the industry’s strongest warranty. The biggest difference between fiber-cement plank (such as Hardie plank) and vinyl siding is in the apparent shadow line created under each course. Because of its weight, fiber-cement plank is made considerably thinner (almost half) than corresponding wood plank, and also the vinyl siding that imitates the wood. Vinyl siding is a lot more affordable in terms of material cost and less labor heavy. The installation is easier and happens faster. We also install Cedar siding. Cedar siding may last up to seventy five years if properly maintained. It has a natural ability to repel insects. Vinyl will probably last forever; won’t dent or chip; color is all through the section of siding, color may fade after ten or fifteen years; absorbs heat, too much heat can cause vinyl to buckle. Cedar siding requires professional installation, it might not be properly installed by your handy man. Vinyl is a cost effective soution when it comes to siding as it requires much less on-going maintenance . Vinyl siding is a great option for your home’s exterior. Many homeowners are choosing vinyl siding instead of painting their home’s exterior. Vinyl siding comes in a variety of styles and colors. You can easily change the look of your home with vinyl siding!